Ok, so I started a separate thread for this because it spans the IDW books throughout the series. 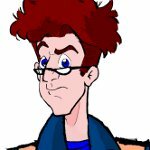 I want to talk about the possible significance of Roger looking like Egon. Obviously, it never escaped prime Egons notice, but Janine was oblivious to it. But now, we have EGB Egon show up, and everyone who saw Roger sees that they are the same. Now I remember the speill about how a physical appearance can be in multiple universes without them being the same person, from the answer the call arc. But what are the freaking odds! So everyone, including prime Egon, decide that Janine's head may explode or something if she meets EGB Egon. But why? Wouldn't Janine be able to comprehend it?! She's not dumb. What is it they are afraid may happen? Also, if Tiamat is wanting to cause chaos, wouldn't it make since to put Prime Janine, prime Egon and EGB Egon on the same team? I have more thoughts, but can't organize them, so y'all jump in. If she ever finds out that they are hiding him from her she might get angry. I know I would not be happy if people were condescending enough to decide that I am not stable enough to bear something like that. Especially if this is done by people I trust like Janine trusts Peter, Egon, Ray and Winston. At the very least she would be disappointed and hurt I think. Also I am wondering why she never asked the Extreme Ghostbusters about their mentor. She mistook RGB-Egon for Roger in „Get Real“ for a second. So would she not be curios about the older version of the guy that looked like a younger version of her Ex? I can imagine Prime Egon wanting to keep them apart. He really did not look happy when he introduced EGB-Egon to the assembled Ghostbusters. He becomes a jealous a..hole pretty quickly when it comes to Janine and other guys even though he never makes a move on her himself. Jerk! . I think one of the problems the writer has here is that Roger’s Appearance probably was just a joke, an easter egg for the fans when they started the series. But now that they crossed the universes they cannot just ignore the fact that he is a doppelganger of some Egons. So maybe they will use it later for something of importance. But I would not be surprised if they just wanted to get it out of the way and the 68-E file was the last thing we ever hear of it. Probably Janine sees him in a situation where there is trouble brewing and when she wants to say something Peter will be like „Not now, Janine! Kill us later please!“ And we never get to see this „later“. Going back to that infamous rooftop conversation between Egon and Janine waaaay back in Volume #1. Egon told Janine that she dated people who 'shared one or more superficial characteristics' with him, and he admitted that he was jealous of Roger. With Roger, she didn't just 'get disinterested' and 'return to aggressively flirting' with Egon, as Egon had predicted she would. She remained with Roger until HE moved away. So, there was something different about this relationship than the others she had. Presumably, this is because she was basically dating 'Egon'. It wasn't just 'any guy'. It went beyond her just trying to make Egon jealous. Maybe she stopped aggressively flirting with IDW Egon because she is still, to an extent, getting over her relationship with 'her' Egon (Roger). A relationship which affected her on a deeper level, because it was someone she truly loved. Going back to IDW Egon. He was jealous of Roger because he thought Roger was just 'another guy' that she'd get over and eventually go back to flirting with him. IDW Egon now knows that Roger wasn't just another guy anymore. He'd underestimated Roger's role in Janine's affections. Roger was basically an alternate universe version of his older self. It's probably like finding out someone you love has fallen in love with your doppelganger. And he was jealous... of himself. And he knows she's not fallen back into her normal pattern of behaviour, which has probably skewed the f-ck out of his flow charts. I think, even though Roger looked vaguely like himself and sounded like himself, it probably never really struck home with Egon until he saw EGB Egon. So, now he knows that Janine was dating someone who she really loved (a version of himself), that she's probably still upset that they are not together (because she hasn't resumed her habit of flirting with him), and that he's going to have to 'bring Roger back' in order to carry out the work he needs to do. I don't think IDW Egon feels any animosity towards EGB Egon (he did call him an asset, after all), and I don't particularly think he is jealous of EGB Egon, either, because Janine hasn't dated him. I think he probably feels unhappy that he needs to bring EGB Egon into 'their' universe, because of the implications it has for Janine, and I think he probably realises just how much he underestimated Roger and how much Janine felt for him. Maybe there's also a small part of him that wishes he'd done things differently, and maybe that he regrets what he said on the rooftop. I think, regardless of what Peter thought, Egon probably was of the opinion it would be best to keep them apart in case Janine would a) be upset, and b) possibly want to date the guy. Not as a Roger replacement, but as someone who she felt deeply for, and who she seems to have a natural attraction toward. As you said: what are the odds. However, I still think that decision should have been hers. Unfortunately for us, I don't think we'll ever find out exactly how IDW Egon feels about EGB Egon, so these are all major assumptions on my part, and obviously other people won't share the same views. But that's my take on the situation. Now, that would have been something interesting. I think one of the problems the writer has here is that Roger’s Appearance probably was just a joke, an easter egg for the fans when they started the series. But now that they crossed the universes they cannot just ignore the fact that he is a doppelganger of some Egons. So maybe they will use it later for something of importance. But I would not be surprised if they just wanted to get it out of the way and the 68-E file was the last thing we ever hear of it. I tend to agree with you. I think this is how they've addressed the issue, and that's the last we'll hear of it. We're just left to speculate about the whys and hows and motives of those involved. Man, I had this brain drizzle I couldn't shake and just have to share. Wouldn't it be awesome if the reason IDW Egon's so spooked about the idea of IDW Janine meeting EGB Egon isn't (just) because of his resemblance to Roger? In meeting his EGB-based counterpart, he learned something that hasn't been shared with the audience yet, that really unnerves him. What if it was because the EGB characters come from some time after EGB itself, and per the trajectory of things in "The Crawler" and "Back In The Saddle", much like in some animation-based fan fic continuities, EGB Egon and EGB Janine are an Official Item...or even better, married? IDW Egon really REALLY doesn't know how to handle this, and really really REALLY doesn't want to deal with IDW Janine knowing this. I mean, I've pretty much given up on Sony letting IDW and/or the live action universes let it happen. But wouldn't it be a nice little bone to throw to longtime fans to establish "Yes, indeed, in SOME official universes, they actually made it work."? Especially since it's one that Sony and GhostCorps don't consider the "real" Ghostbusters universe? I'm gonna try to compile my thoughts on this stuff, but basically I feel like this is a huge plot point. There's been too much mention of it, it's a long spanning thing and it's been implied that Egon will have a big role, but also Janine too. Then EGB Egon shows up, after the other team members, and it gets mentioned in the memo page... No. It's gotta be bigger than a one off.